Nina Lilian McClary passed away peacefully at the Devonshire Continuing Care Centre, Edmonton on August 11, 2017. She will be remembered with great love by her daughters Maryon McClary (Fred Judson) and Margo (Geoffrey) Doty, her daughter-in-law Marcia McClary, and her granddaughters Ellen and Bryn McClary and Sarah Doty. Nina also leaves nieces, nephews and a host of multi-generational friends. Nina was predeceased by her parents David and Margaret Sands, her beloved husband Robert (Bob) Earl McClary, her son Brian McClary and her sister Betty McInnes. Born and raised in Edmonton, Nina graduated from Victoria Composite and attended Normal School at the University of Alberta. Her first teaching position was at the one room schoolhouse in Hart Valley, Northern Alberta. She also taught in Round Hill, Alberta and at Delton Elementary School in Edmonton. She met Bob, the love of her life, at Central United Church choir practice and they married in 1950. Together they provided a wonderful life and incredible memories for their three children. 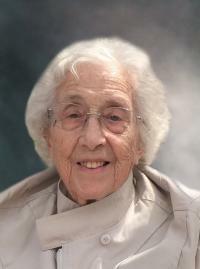 Nina was an active volunteer, making particular contributions to the United Church Women, leading CGIT and presiding over the Glenrose Women’s Auxiliary. She was a skilled organizer and multi-tasker, which allowed her to excel at entertaining. Nina was engaging, caring, gracious, cheerful, strong, determined, resilient, fun and welcoming to friends, family and those in need. Nina’s two special joys were her Granddaughters and the 88 summers spent at Seba Beach. Heartfelt thanks to Nina’s care companion Mary Jane Bedis, who brought her great joy during difficult times, and to the staff at the Devonshire. A Memorial Service will be held at Highlands United Church, 11305 – 64 Street NW, Edmonton on Thursday, August 24 at 2pm, followed by refreshments in the Church hall. At Nina’s request, in lieu of flowers, please consider donating to the Cross Cancer Society, Highlands United Church or a charity of your choice. The family adds that support to organizations conducting dementia and Alzheimer’s research would also be appreciated.